This series is about transformation. 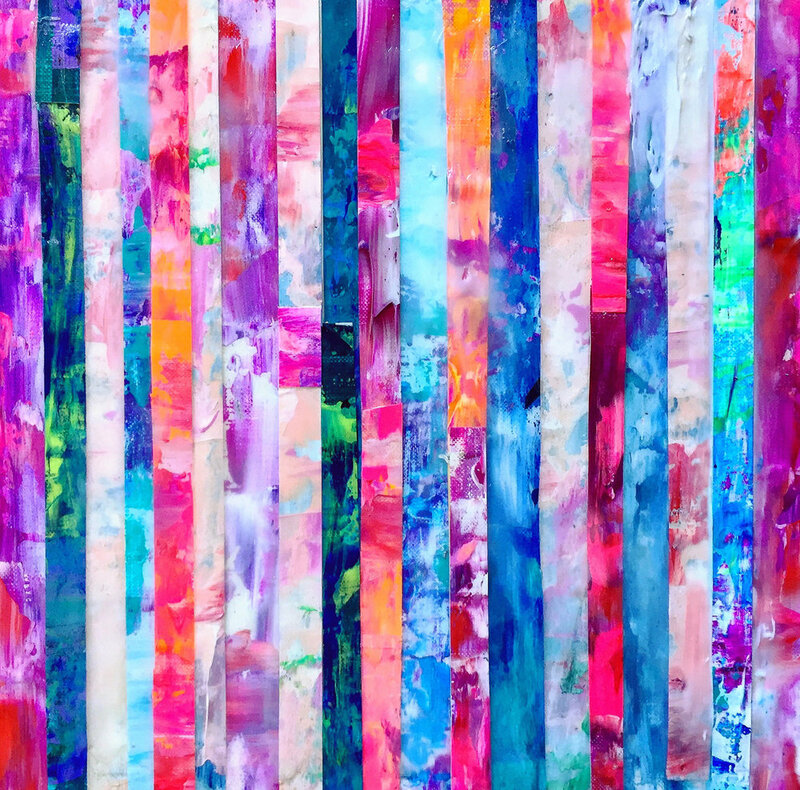 The paintings are created by cutting strips from various large, finished paintings on loose canvas and reassembling the strips to create a new, smaller painting. Because the original paintings are destroyed, this process is simultaneously terrifying and freeing. Nothing remains precious. This series started when I was asked to donate work to Girls on the Run Chicago, a nonprofit that teaches girls confidence and healthy habits through running. I wanted the paintings to reflect nature, like water and air, and elements one sees while running. The color palette was intentionally selected to reflect this. I added hues of grays to allude to cement, concrete, steel, subway tracks and other materials found in the city of Chicago where running is likely done outside. Additionally, concrete is extremely resilient, a characteristic that is important for young girls. When finished, the entire series reminded me of spring, which is a time of rebirth. The paintings are titled after Greek and Roman goddesses. The names reference the story of Persephone, the Goddess of Spring, who is kidnapped underwater by Hades and becomes Queen of the Underworld. The main concept of this series is deconstruction and transformation since that is what running does to a body. Running can be extremely challenging and break your body down. Yet eventually a transformation occurs, and the runner becomes stronger. My larger abstract work is about paradoxes, and these paintings also address opposing concepts. The precisely cut strips create a rigid composition, yet the painting also seems delicate because of its petite size and fluid aesthetic. Each work is acrylic and canvas on wood panel and protected with a UV resistant varnish. The paintings are signed on the back and can be hung either vertically or horizontally.